As sweet as cinnamon: PIF - almost done. This week I have been working on my Pay It Forward gifts and so have no pictures to show of them - or I would spoil the surprise - they are almost done. I will show you a couple of the things I have made for my swap partners from recent swaps. The first was a real challenge for me - it was to do a quilty - which is a small quilt in a 6 1/2" square. I chose a 'once upon a time' theme and used an old doily that I had with ribbon, ric rac and buttons - sort of romantic looking. 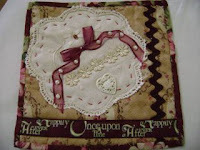 And this is of a cushion I made for a prim swap I was in. It doesn't look that prim, as I tried to make it also shabby for my swap partner cos she likes shabby too. It does have raw edge appliqué on it and I like the look of that technique - sort of prim . I used an old doily for the underneath of the appliqué and added buttons, lace and crocheted flowers for the hearts on the corners. I was very pleased with the way they turned out, and I received lovely swap items back. sorry no pics as my camera is not working again. I am in a couple of other swaps and find them really challenging and fun. I am in a teeny tiny swap and have to make a gift for a partner and be able to post it for only 50c - wow what can I make - I have an idea..........thinking, thinking....will show pics later. I also am in a cornucopia swap and have found a lovely pattern... but first to finish my PIF gifts. I really like the colours and the design of your second photo. What a good idea to have a tiny swap, nice to create something but not as much pressure. You're right - that cushion with the doily on it is so romantic looking - really stunning! The Ark picture looks great in your sidebar, thank you and well done for getting it there!